In a high stakes industry like healthcare, it’s especially important that accountability and patient safety comes from the top down. In December 2018, Inova Alexandria Hospital was named a Top General Hospital by The Leapfrog Group, an independent hospital watchdog organization. This honor highlights the hospital’s nationally recognized achievements in patient safety and quality over the past few years. 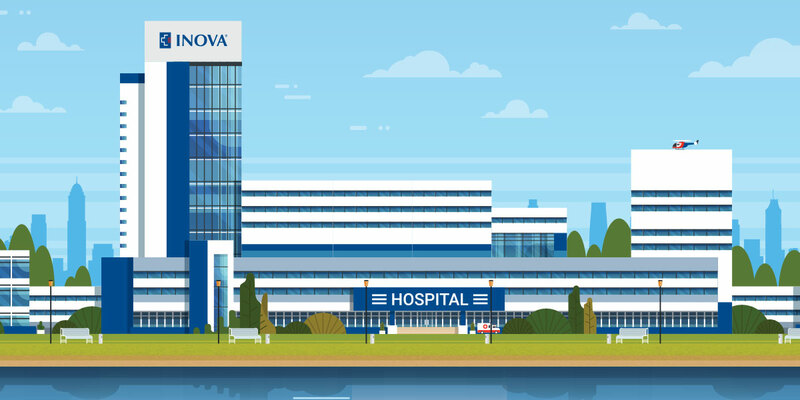 As other hospitals struggle to keep up with dramatic changes in the industry, from rapid shifts towards consumerism and moving into cost reimbursement based on health outcomes and cost savings, what is Inova doing differently? When it comes to the healthcare industry, it’s hard to find someone with more experience in fostering accountability in an organization than Susan T. Caroll. A former CEO and current Regional Executive Officer of Inova Health System, Caroll spearheaded Inova’s culture transformation during her time as CEO at the facility. She has since brought an accountability mindset to each of the five hospitals within the eastern region. One of the secrets to Caroll’s great success in implementing the accountability mindset is her recognition that the incredibly high stakes in healthcare necessitate this shift. She explains: “In healthcare, you can’t just be financially stable and be considered successful. You also have to produce tremendous quality outcomes.” Here’s how Caroll transformed her organization’s culture into one that fosters accountability at all levels. Caroll understood that to get buy-in from her top executives, she had to explain accountability in a way that spoke to their business-focused view of the world. “It wasn’t as much talking about culture as it was talking about outcomes,” Caroll said. The next step was to acknowledge that the existing culture was not the fault of any one person or department. Caroll recognized that the effort to change it had to be both cooperative and intentional. With that realization, Caroll set out to reform the organization’s collective mindset. Once the cultural issues were identified, Caroll and her team devised strategies for improvement. The first thing they did was to identify key metrics that were indicative of culture, insisting that “no metric was too small or too insignificant to measure.” In fact, the organization’s metrics reports eventually topped 65 pages — but by taking a comprehensive view of those metrics, a number of important themes emerged that would guide the cultural transformation. As a system of healthcare facilities, the organization’s primary focus is “zero harm.” Caroll and her team devised innovative ways to foster this ambitious outcome. For example, teams within the organization do morning huddles where they talk about incidents, both negative and positive, that have occurred over the last 24 hours. In the past, the discussion was limited to the number of incidents: “We might get together and say ‘okay, we had 17 patient falls over the weekend,’” Caroll explained. Today’s huddles are very different. Caroll gave us a sense of what a present-day discussion might look like: “Let me tell you about Jared. He fell over the weekend. He has five girls at home.” In other words, the culture shifted to a focus on the people behind the incident, rather than the number of incidents overall. According to Caroll, this subtle cultural shift had a huge impact on outcomes. By 2016, just one year after it had set out on its journey to achieve Zero Harm, Inova achieved dramatic results with a 72% reduction in Central Line Infections and Catheter Associated Urinary Tract Infections; close to 50% reduction in Hospital Acquired Clostridium Difficile Cases; 42% reduction in Falls; and an increase in Hand Hygiene compliance to 95% (up from 53%). These improvements saved the hospital $500,000. It’s no wonder Inova was named as a Top General Hospital by The Leapfrog Group.